There are so many amazing quotes out there that focus in on what needs to be done and does it in a sentence or two. 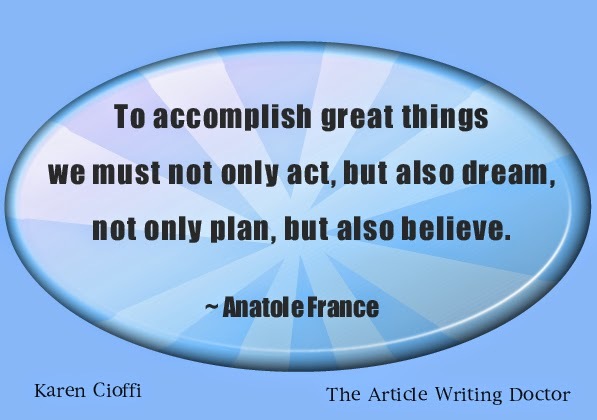 The quote above from Anatole France, does just that. It reminds me of the Bible quote: "Faith without works is dead." No matter how much planning you do, if you don't take actionable steps, you won't get anywhere. And, if you can't dream it or believe you can accomplish it, you no doubt won't. You need to 'walk the content marketing walk.' Create your marketing plan with doable steps and then actually follow through. If you notice, I said,to create doable steps. If you create unrealistic, unobtainable goals, you're setting yourself up for failure. It's small actionable steps that you can actually do that will motivate you. Regularly accomplishing small goals gives encouragement and confidence. This will keep you moving forward. And, be sure to take a step back now and then to evaluate how you're doing and to dream of your next plateau.